In early 2014, I saw a film called “Robot & Frank.” I think I found it browsing through a robotics website. I know just a little about robotics, but am VERY interested 🙂 I was impressed with the film, and have recommended it to many of my friends already. Robot & Frank is a 2012 American film directed by Jake Schreier and written by Christopher Ford. Set in the near future, it focuses on Frank Weld, an aging jewel thief played by Frank Langella, whose son buys him a domestic robot. Resistant at first, Frank warms up to the robot when he realizes he can use it to restart his career as a cat burglar. It was the first feature film for both Ford and Schreier and received critical acclaim for its writing, production, and acting. It won the Alfred P. Sloan Prize at the 2012 Sundance Film Festival. From Doctor Dementia: The Alfred P Sloan Foundation focuses on science, technology, and economic institutions. The Foundation is interested in projects that it expects will result in a strong benefit to society, and for which funding from the private sector, the government, or other foundations is not widely available. I would very much like to get a grant from them!Set in the near future, an aging ex-convict and thief named Frank Weld (Frank Langella) lives alone and is experiencing increasingly serious mental deterioration and dementia. 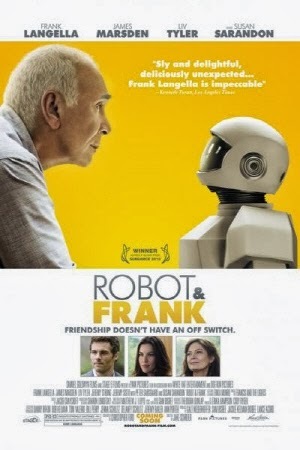 Frank’s son Hunter (James Marsden), an attorney with a family of his own, grows tired of making weekly visits to his father’s home, but is reluctant to put his father into full-time care, so he purchases a robot companion (voiced by Peter Sarsgaard), which is programmed to provide Frank with therapeutic care, including a fixed daily routine and cognitive enhancing activities like gardening. Initially wary of the robot’s presence in his life, Frank warms up to his new companion when he realizes the robot is not programmed to distinguish between legal recreational activities and criminal ones, and can assist him in lock-picking. Together, the two commit a heist in order to win the affection of the local librarian, Jennifer (Susan Sarandon): they steal an antique copy of Don Quixote from the library, which is being renovated and turned into a community center in the wake of declining interest in print media. From Doctor Dementia: I think this part shows the effects of reduced decision-making well, and Frank later realizes what exactly he did and that his plan wasn’t so great. Frank goes to the library where he discovers that Jennifer is his ex-wife, which he had forgotten. He then returns home where the robot convinces him to wipe its holographic memory, as it is not a person and its sole reason for existence is to help Frank. Frank is then sent to a “Brain Center”, where he receives help in coping with his dementia. The police do not recover the jewels that, as Frank explains in a note to Hunter, are hidden under the tomato plants in the garden that the robot made. the robot was created by Alterian, a Los Angeles-based effects company notable for their costume design for Daft Punk (a cool band). The filmmakers wanted to emulate the style of caretaker robots made in Japan, and the design also needed to allow a human actor inside the robot suit, played by Rachael Ma. I agree, I thought it portrayed very real aspects of aging and early signs of dementia, as well as family and community dynamics. Watch it if you get the chance! This entry was tagged active aging, assistive technology, dementia, dementia care, film, movie, robot, robotics. Bookmark the permalink. Thanks for the re-post! Have you seen the film? I would like to hear your opinion, if you have.